I haven't completed many projects this week, but I thought I'd share some of my pre-blog projects that I loved. Enjoy! 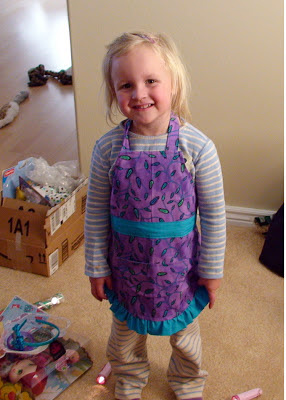 Last year for Christmas, I made aprons for my nieces using a tutorial found on Tidbits. They turned out so cute and I have big plans to make one for Violet as well... as soon as I have a lull in my crafty project load. That might be never. Inspired by my sister-in-law, I made hooded towels for both of our kids for Christmas as well. I added a strip of patterned fabric to make them a bit more fun. Hooded towels are a must-have with little kids. One of the best ideas I ever had is one I don't have a photo of. Before Eddie was born, I had the brilliant idea to put a dimmer switch in his room. Our kids' bedrooms are ridiculously small, so we didn't have a place for a lamp. The dimmer switch has been a lifesaver -- during midnight nursing sessions, night terrors, and the current "afraid of the dark" phase. The second greatest idea I ever had resulted in this wall display. We got these collage frames from Target and originally just had one. But when we wanted to display our family photos in our living room, we needed something more substantial to fill the space. So I bought a second collage frame, then carefully cut the circles apart. I love the "floating bubble" effect. A couple of months before Eddie's 2nd Halloween, we read Where the Wild Things Are every day at least once. It was his favorite book, so we thought it would be very fitting to make Eddie a wolf suit so he could be Max for Halloween. This was my first attempt at sewing anything so complicated, so I modified an Eeyore pattern, adding buttons down the front, and totally improvising on the hat. It turned out surprisingly cute all things considered. 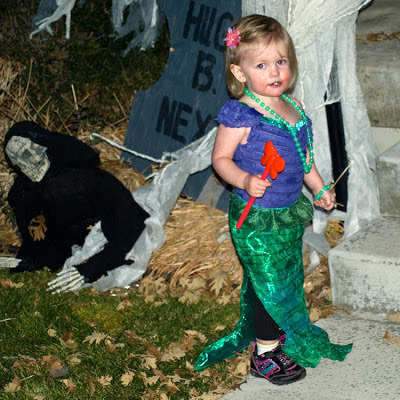 Plus it gave me more confidence so I would dare to keep trying to make our kids' costumes. Violet went through a Little Mermaid phase where she would sing like Ariel all the time. This costume took a lot more creativity on my part. Luckily, I found the perfect fabrics at JoAnn. For the tail, I cut the fabric into a tail shape (one for the front and one for the back) and made the tail more like a skirt so that she would still be able to walk. Violet doesn't take small steps either... she really struts around. So I had to make the slit pretty high to accommodate. The tail has an elastic waist. For the top, I basically made a ruffle fabric onesie. I cut the ruffle fabric into onesie shape, sewing the crotch and sides. Then I added little fluttery sleeves and embellished with some sparkly ribbon. Ruffle fabric is already really stretchy, so I didn't have to worry about it fitting too well. A little dollar bin plastic jewelry finished it off. Years ago, my brother moved into an apartment on his own. Once he didn't have roommates, he felt he could decorate as he wished and he requested a sign that said "Don't let the door hit you where the good Lord split you." I decided that if I was going to create such a sign, I should make it as gaudy as possible. 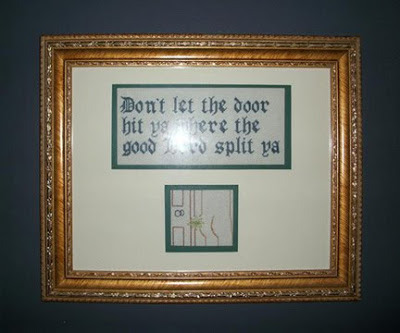 So naturally I opted for an Old English style embroidery. Then Dave used his artistic skills to create the graphic, which I embroidered as well. The frame is just the icing on the cake. 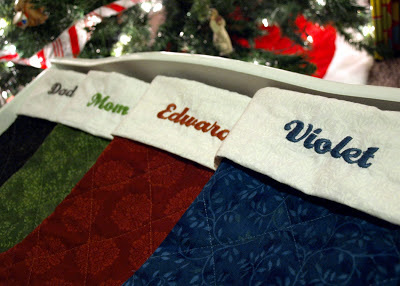 After Violet was born, we decided we needed matching Christmas stockings, so I made them. I combined two different tutorials (FabricWorm & Prudent Baby). I embroidered our names onto the cuffs and they turned out beautifully. Thanks Jenna! And thanks for the invite to your linky party. I linked up and I'm following all 5 of you on Facebook. These are all great! 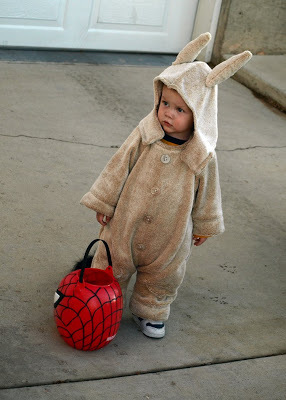 I have boys too and a "Where the Wild Things Are" costume would be perfect for any of them. Thanks Robin! I'm glad you stopped by. I'm going to start following your blog.